Dramatic winged eyeliners, fringes, puffed hairstyle, bright colour crop tops, high waist jeans and the “cool” necklace went flying out of the window when their time came. I hate to pop your bubble but some of your favourite things are probably out of fashion already. For example, the mehendi/haldi decor you see everywhere! Mehendi/haldi functions are supposed to be light, full of laughter and pretty pretty decor! I, the decor police, am here to tell you which ones are cliche and aren’t making the headlines anymore! 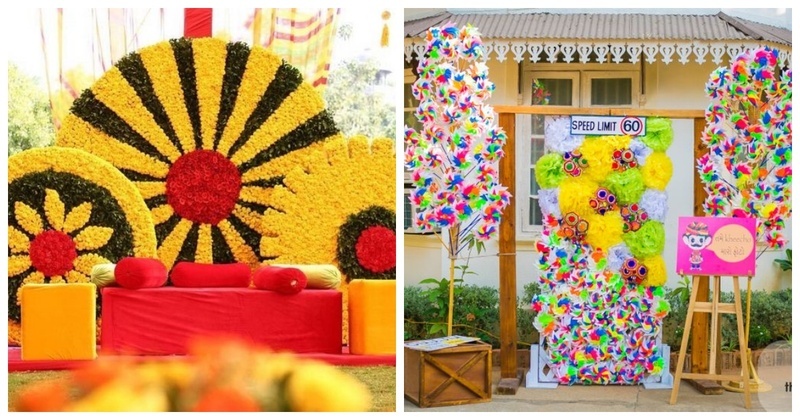 Darling, don’t be a fool by using genda phool in every element of the decor! No matter how big a genda phool lover you are, gone are the days when your mehendi ceremony needed a dozen kgs of the same! Cute couple shots on decorated bicycles? Chaddo! Bicycles are done and dusted, and it’s time for you to move on! Oh god, this one needs to go out ASAP! No moustaches or lips or glitter hats please! But I do encourage any new cool props that you can think of, like tiaras! Can “welcome to our beginning” just be excluded from the entire decor? Yes? Thank you! You know where pinwheels look fantastic? Mela! So let’s not turn your function into a mela, okay? I am all for quirky brides but you don’t need boards that say ‘pataka dulhan’ etc to prove that! Imagine clicking a picture in an Instagram frame and uploading it on Instagram. Yikes! NO. Just NO! We have seen enough of that in the last 2 years. Mason jars are cute but for cafes. Not decor! Follow these instructions if you don’t wish to get arrested by the decor police!